Today is launch day for the new gorgeous Classic Wedding Collection! Other Products: Pearl White Metallic Cardstock, Silver Cardstock, VersaMark, Silver Embossing Powder, Encore Ultimate Metallic Silver Ink Pad, Misti, Big Shot, Dimensional Tape. Instructions: Create a 6” x 6” card base with the White Pearl Metallic Cardstock. Cut a silver layer 5 7/8” x 5 7/8”. Trim the wedding bells panel from the paper pad to 5 3/4” x 5 3/4” and ink the edges with the silver ink. Using Dries Clear Adhesive adhere the designer paper to the silver mat and then attach them to the card base with dimensional tape. Cut two of the Medallions from white pearl cardstock and add Dries Clear Adhesive to the center of them (don’t glue around the edges) and adhere to the card as shown. Stamp the bells and the wedding ring with VersaMark and heat emboss with silver embossing powder. 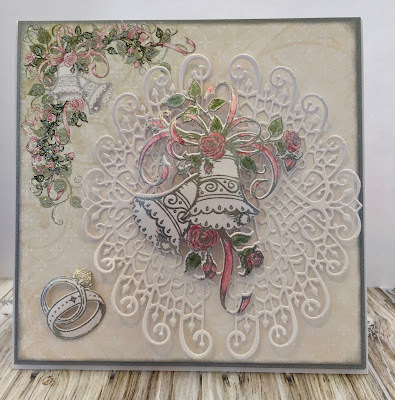 Use the Pearlescent Poppy and the Pearlescent Coral to add color to the bells and adhere them to the card with Double Dots. Add Dries Clear Adhesive and Rajni Chawla’s Crystal Clear to the diamond on the ring. Glitter the paper and the bells with Crystal Ultrafine Glitter. What a beauty! I love all your attention to detail! I love how you used the two decorative die cuts to form almost a circle!! Circles are such a beautiful decorative element to me. I love your bells, your colors, your beautiful card!